We’ve all heard the buzz about email marketing and how simple and cost-efficient it is to do. It is true that email marketing helps companies see instant sales from existing clients, and more importantly, it helps to build and maintain long-lasting, reliable relations with your customers. But are you sure that all your recipients are opening their emails? In order to be a successful email marketer, it is essential that your subscribers open and read your messages. In fact, if your recipients aren’t opening your messages, they will not be able to take any action by navigating to your site or making a purchase. If you are experiencing poor email open rates and are seeing them gradually declining, it is time to search for the root cause of the issue. In some cases, it can be a basic fix, but frequently your email marketing may need a complete overhaul. 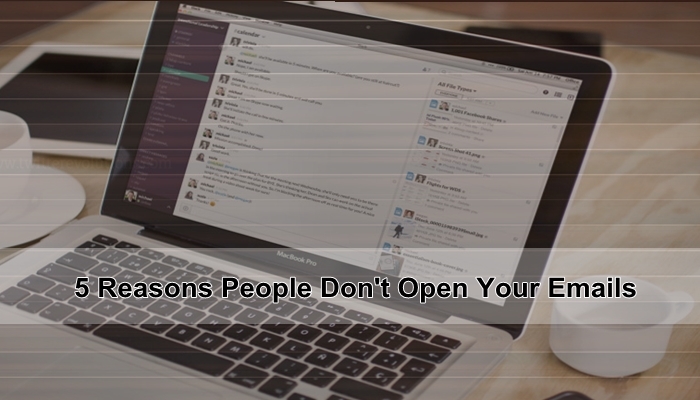 Here are some of the common reasons that cause poor email open rates. Read and analyze which one applies at your end. You need to understand that most of your email subscribers signed up because of your initial offer. You offered them something that they felt was somehow valuable to them, so be sure that the message you sent is relevant to that initial offer. You must know your target market well enough to be able to craft a message that speaks to them. If they have to read through a bunch of fluff to get to the “good stuff” in your email, they will not open your next email. Solution: You need to work on your messages and their subject lines. Provide value in the content while ensuring that the subject line is captivating as well. Here’s our guide on how to craft your email subject lines. According to a study, one of the top reasons that people unsubscribe from emails is due to the content that isn’t important to them. If a person’s inbox is overflowing with dozens of emails every day seeking his attention, why would he waste his time reading something that doesn’t interest him? Solution: What can you do about it? Understand what your audience needs and provide content that is valuable to them. Remember, you need not send the same material to everyone. You should segment your list into groups and give every group some relevant content. If you are using a marketing automation platform with some good analytics tool, you can avoid that. By understanding your prospects and market better, you can do better campaigns. At Makesbridge, we’ve three different tools and techniques to help marketers track their audience and do better marketing. You can track individual performance of each campaign and prospect activity; can also compare multiple campaigns’s performance on a single dashboard, and also track your complete website traffic with complete demographical insight. Check the following video and learn how we can help you tackle that issue. The subject line of your email is the most critical part, even more than the actual content of your email message. But why? The subject line is the first thing that they see and influences them to open your email. Solution: Try to avoid using generic email titles such as “Email Newsletter” and don’t use the same subject line again and again. It is also a good idea to test different messages every time you send an email or go for A/B testing, if your ESP allows that. Here are some of our recommendations for better email subject lines. If you are sending emails at odd hours, or when people are too busy to respond; chances of failure increase. Midnight, weekend, peak office hours, and first and the last working days can be listed in the category of wrong email times. Solution: Depending on your campaign, the recipient and the substance of your message, sending your emails at different times can prompt better open rates. For instance, if your target audience is made up of people with 9-5 desk jobs, you may find better open rates in the mid-morning or late evening when most of them are either simply relaxing, or enjoying a break towards the end of the day. However, if your target audience is of people who are on the move continuously throughout the day and who would not be able to check their messages frequently, early morning or nighttime may prove better times for your open rates. If your emails and newsletters are not designed for mobile devices, you are going to lose the lion’s share of your subscriber base. More than half of all emails sent in 2014 were opened on a mobile phone, and that number is much higher now in 2015. Nearly 88% of business executives check their emails on their mobile device today and overall percentage is set to increase in the near future. In addition, since Google’s release of mobile update, all webpages have to be mobile friendly, if they’re to exist in search results. Solution: If you are designing your own template, make sure that they are mobile compatible and can scale with the screen size. However, if you’re relying on the templates gallery of your ESP, make sure to test them on the mobile device. To ease this problem of marketers, we’ve ensured that all of email templates in our marketing automation system are mobile-friendly. Likewise, most of the reliable email marketing solutions will let you design and create personalized and mobile friendly newsletters/templates. But here again, make sure that you study your prospects and learn their behavior, as per past campaigns’ reports. Refer to analytics account to better understand what percentage of your traffic is originating from mobile devices and what areas you need to work on. Hopefully the suggestions will help you do better email marketing and achieve your goals. If you want to send us your feedback or want us to cover a topic of your choice; write us an email or get in touch with team Makesbridge on Twitter, LinkedIn, or Facebook .